Quintessence Tea Tree have a unique formula that is said to heal and relieve any discomfort and replace with relaxation. 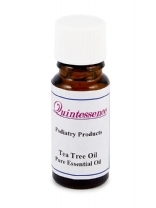 Over the last few years there has been an increase in the use of tea tree oil products in Podiatry. DLT have selected a range of products to provide treatment useing this essential oil. Tea tree oil products can be used for treating fungal infections, and is a very good antisepic.